Browse Rozen Maiden Gallery: Recent | Popular. Esto es curioso. Mi primer wall tambien fue de Rozen Maiden, inclusive fue con el mismo gráfico que tu usaste. Me parece que lo hiciste bastante bien. Lo incluiré entre mis favoritos. This is peculiar. My first wall also was of Rozen Maiden, inclusively was with the same graphic that you used. It seems to me that you made very good. I will include it between my favorites. It's nice. The scan looks great, and the simple background is nicely done. The two really go well together. Good work. 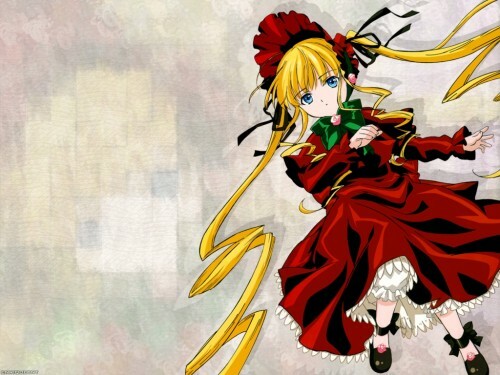 The background is so simple and clean but the color is fit with Shinku ! Great work ! An ordinary wallpaper, but it's great!, you did an excellent work ;). The possition of the character, the image is clean enough. I love this site and this pict.